Leaving the summit of Huron, the 11th summit of Nolan’s 14. 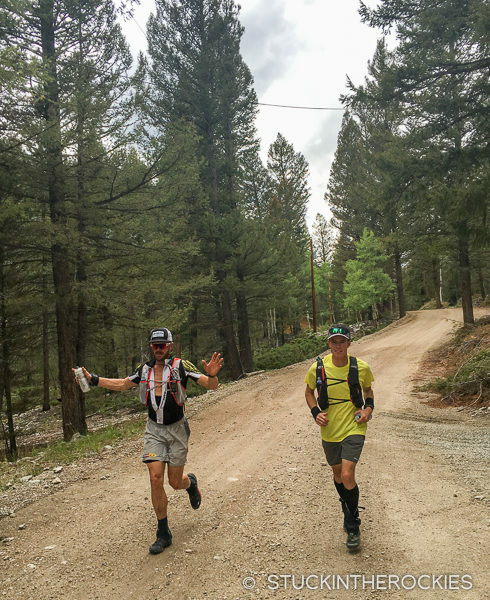 On August 29, 2016 I completed Nolan’s 14 in 55:37, following the route north between Mount Shavano and Mount Massive. 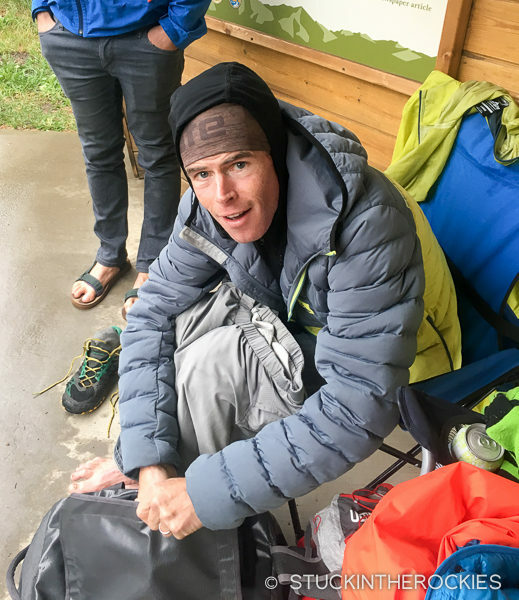 I was told afterwards I was the 15th person to ever complete the near-100 mile course that climbs fourteen 14,000 foot peaks along the way. The multi-day effort was one of the biggest challenges I’ve taken on, and one that’s understandably tough to put into words. It’s important to share some thoughts on the effort though so I’ve put together a not-so-brief recap below. I can talk about Nolan’s 14 at length so there may be some future posts on the topic but in the interest of time I thought I needed to get this up first. Eric “Sully” Sullivan and I at the trailhead at the base of Mount Shavano on Friday morning. It started out smooth, as it should. Eric Sullivan and I left the crew at the trailhead right after the clock hit 9:00 am. We cruised up the trail towards Shavano, trying to contain our energy by just hiking fast, though once in a while we busted into a jog. I had taken about 10 days off with only a couple of short, flat runs of five miles or less in that time. I’m not sure I’ve ever taken so much time off my feet before any other event or race, and it was noticeable. 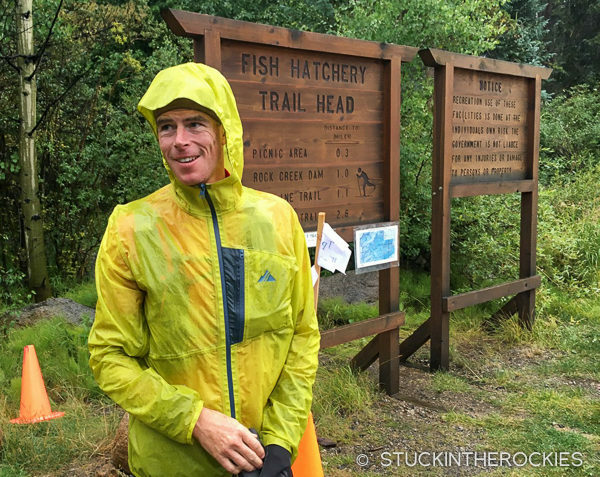 I ran the Hardrock 100 about 6 weeks earlier and my primary concern was recovery, not getting in more training and miles. I definitely felt the remnants of fatigue during some of our recon days earlier in August. But today felt good, and we reached Shavano’s summit in 1:53. As we walked across the top of the peak past some summer peak baggers we each sent our InReach messages. Sully and I both carried a unit because we knew there was a good likelihood we wouldn’t be together for the whole effort. As much as we enjoyed planning and doing the recon as a team, he was always faster than me. We agreed it would be smarter to plan our efforts as if we were out on the course individually. We would start together and then just see how it went. As we left the summit of Shavano and headed towards Tabeguache we were both pumped. This was one of the highlights of the effort for me. After all the years of knowing of and thinking about giving Nolan’s a try, I was finally out doing it. I wish reaching every summit we reached felt as exciting as Shavano, but that would’ve been a lot to ask for. Sully, up ahead, on the ridge to Tabeguache. We made it to Tabegauche quickly, about a half hour after leaving Shavano. Sully and I hadn’t scouted the next descent in advance, he had been up here several times in the spring during his ski attempts on the route and I had skied the North Face years ago as well. We knew the layout but hadn’t been here when it was dry. We headed east to the first little notch below the summit and decided to descend there. As expected it was loose and steep, but generally manageable. 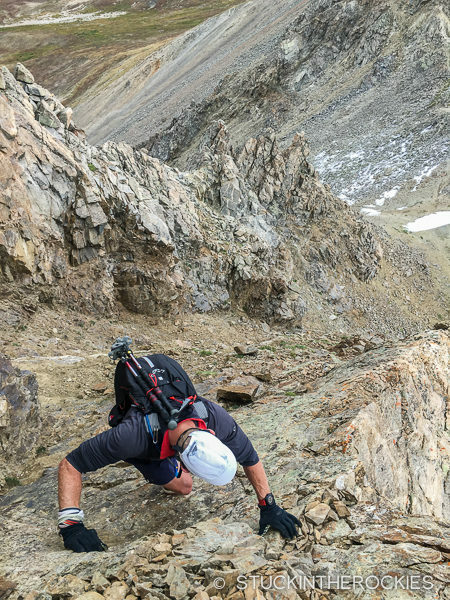 This was the first of many fairly direct descents down loose talus gullies. Traveling in this terrain is never much fun, but if time is important then they’re the fastest and most direct way off some of the summits. Descending Tabeguache, the direct way. On that note, one of the reasons we chose the northbound route was because there were more of these trail-less descents in the front half of the course than the back, so we figured it would be best to get them out of the way. It also meant they would primarily be descents in this direction, which was considerably easier than ascending them. We felt the only unpleasant climb in terms of looseness along the northbound route was on Huron. This point can be argued as there are tough trail-less sections to climb in both directions, but this was one reason we chose to go the way we did. After the descent from Tabeguache we made our way through the willows, topped off our bottles in the creek, and began up Antero. There was some light drizzle around, nothing to cause problems though. Sully was continuing to push the pace and I was starting to feel a bit rushed. 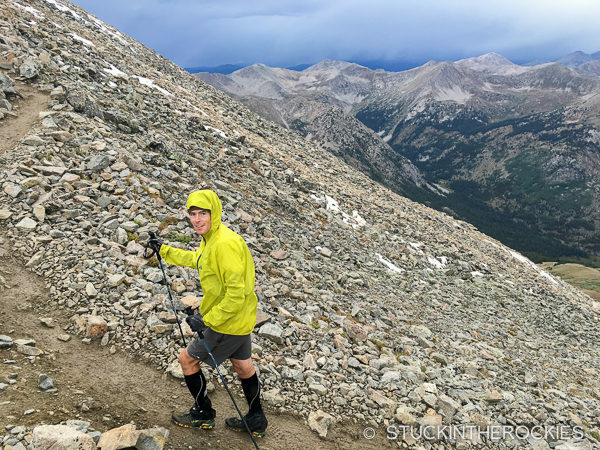 I know what is too fast for me and as we reached the top of Antero at 1:54 pm (4:54 elapsed / 2:32 from Tab summit) we had another brief conversation about our pace. We dropped down into a talus gully below the summit that lead to grassy slopes, which in turn lead to the Baldwin Gulch Jeep Road. 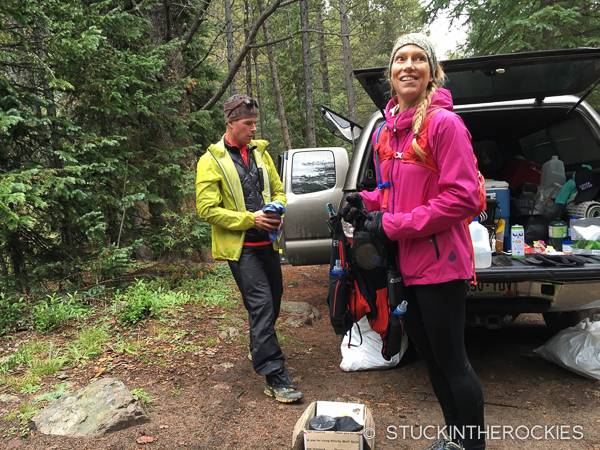 We jogged down the road to Chalk Creek and then through Alpine, where we met the crew and began up Grouse Canyon. On the summit of Antero in pretty good time. Sully found a cardboard sign denoting the elevation. 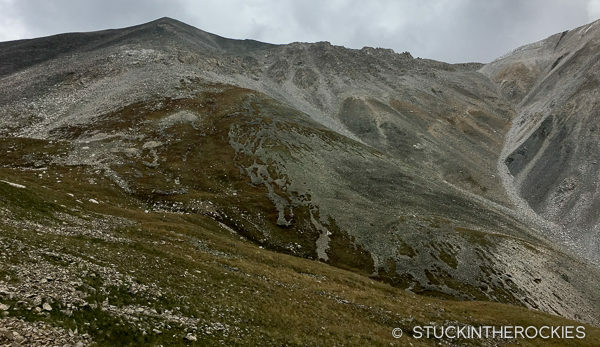 The descent off Antero was similar to Tabeguache. 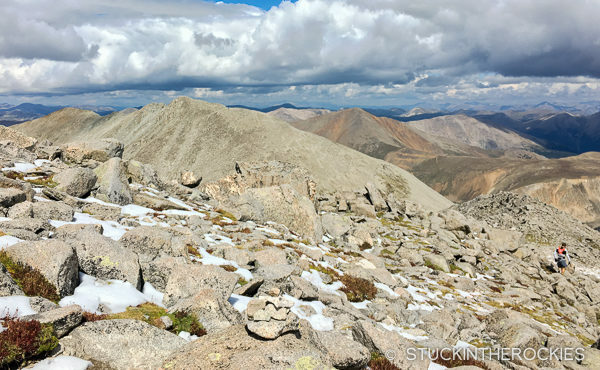 We dropped into the talus to the lookers-right of the summit and then took it down to where we could connect with the tundra and followed easier terrain from there. Running (for the camera) into Alpine. A lot of folks claim Princeton to be one of the more miserable summits of the course, but neither Sully nor I find it to be that bad. The Grouse Canyon trail is pretty enjoyable and the grassy, forested slopes above it are pretty cruisey too. 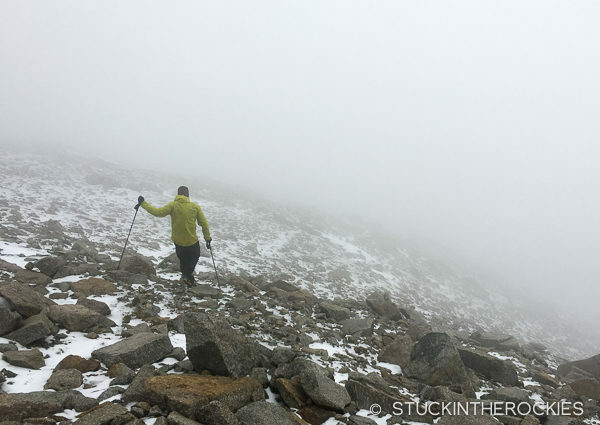 We made the mistake of declaring how lucky we had gotten with the weather thus far, and soon after the clouds rolled in and a complete fog settled around us. Light snow began to fall. At least it wasn’t cold rain. We did get a little wet though, in particular our feet with the wet grass. Sully likes to call me “Dry Foot Ted” as he knows I try my best to keep things from getting wet, in particular my feet on long efforts. They just do better when dry. Nearing the summit of Princeton, in between storms. 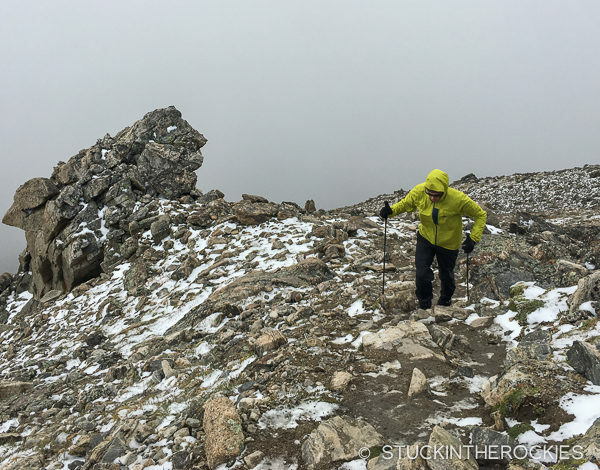 Thankfully, by the time we got on the ridge the snow had stopped and it was just swirling clouds as we made our way to the summit. The wet rocks were really slippery though, in particular the lichens that often cover their surface. Foot placements required a lot of attention. We made it to Princeton’s summit at 6:25 pm (9:25 elapsed) and with some weather coming our way we opted to descend more directly north rather than follow our scouted route which spent more time on the ridge. 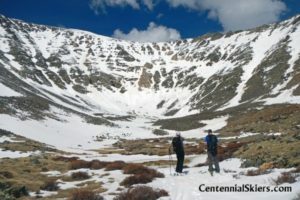 Once down in Maxwell Gulch we picked up the faint game trail which lead to the Colorado Trail. We reached the Cottonwood Pass Road around 9pm, and then the Avalanche Trailhead at 9:35 pm (12:35 elapsed). A short break at the end of the Colorado Trail section after Princeton. Crew met us at the parking area and we opted for a quick 45 minute rest in the sleeping bags. This wasn’t planned but we thought it might be a good idea since this stop would be the last time we would see crew and the sleeping bags until Winfield. It wasn’t late at night and we weren’t exactly feeling “sleepy” tired, but we just thought it would be good to log a few minutes of horizontal rest before heading up Yale. Speaking for myself here, I didn’t sleep, but it was comfortable to lay down and get off my feet. Crew woke us at 10:30 and we got up, ate some more, changed into night time gear and began up the trail towards the East Ridge. 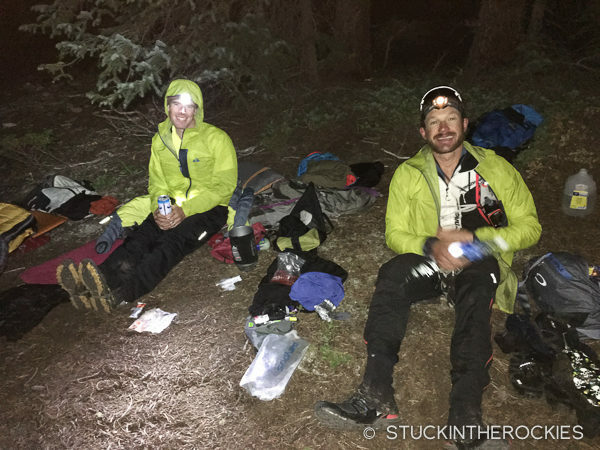 The break was appreciated, we made good time up Yale reaching the summit at 1:46 am, three hours after leaving the trailhead. 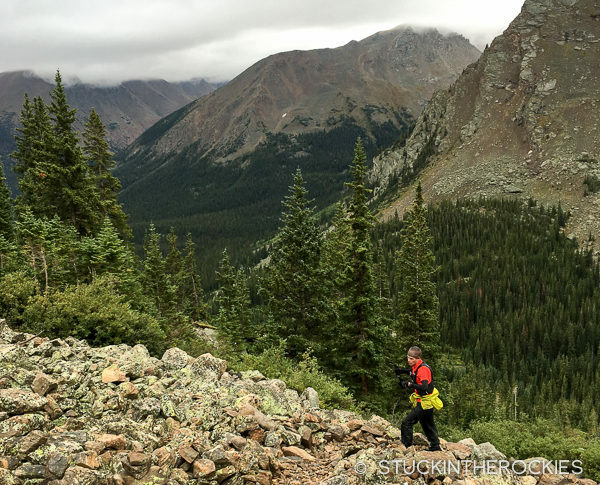 Earlier in August we scouted a route down to the Kroenke Lake trail in the valley below, which we followed to the junction with Horn Fork Creek. We met crew there around 4am and took about ten minutes to reload for the next big leg. 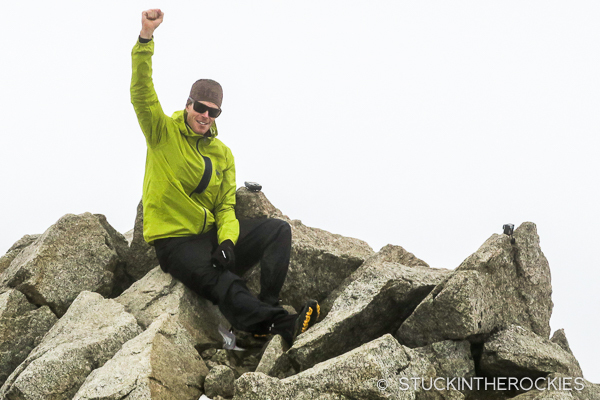 Our friend Sean Shean showed up unprompted, and offered to join us for the next two summits. The three of us headed off and up Columbia, via the semi-steep and broad South Ridge. 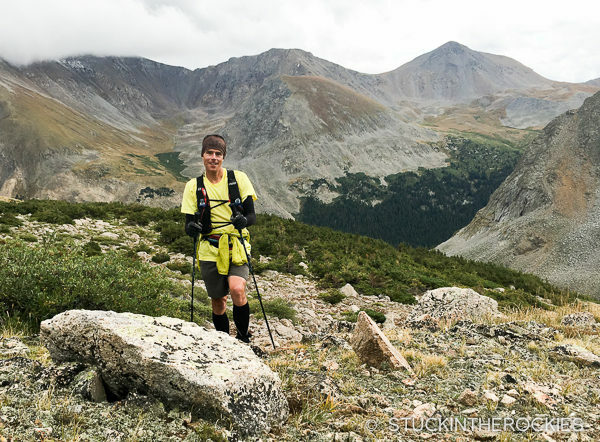 And another short break at the fork of the Kroenke Lake Trail and Horn Fork Basin. Sunrise arrived as we reached the summit ridge, but we knew from the lack of stars through the night that it wasn’t going to be a great morning. We caught a little view of the sun as it crested the horizon which was helpful in fighting back any sleepiness we had. But it was soon obscured by clouds, clouds that would remain all around us for much of the rest of the journey. The traverse was uneventful. If anything it just felt slow, a combo of the early morning hour and the difficulty in rallying any strength since we still had so far to go. I felt like we had been going forever yet we had only reached 6 summits. But contrary to those feelings, we reached the top of Harvard at 8:50 am, just ten minutes under 24 hours. So I guess we were actually moving pretty fast. Leaving Columbia to head towards Harvard at daybreak. 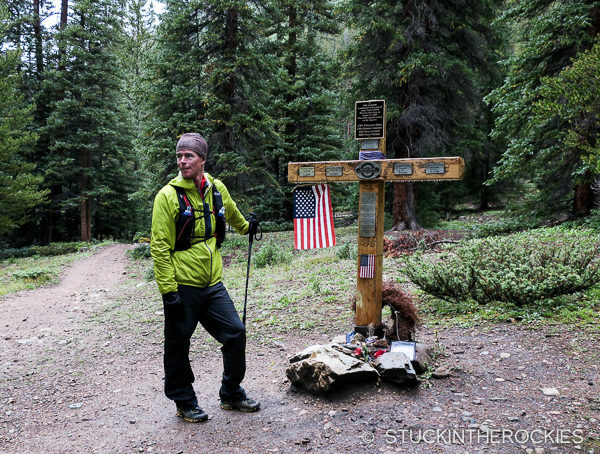 Sean went back down to the trailhead from Harvard and Sully and I started down towards Pine Creek. 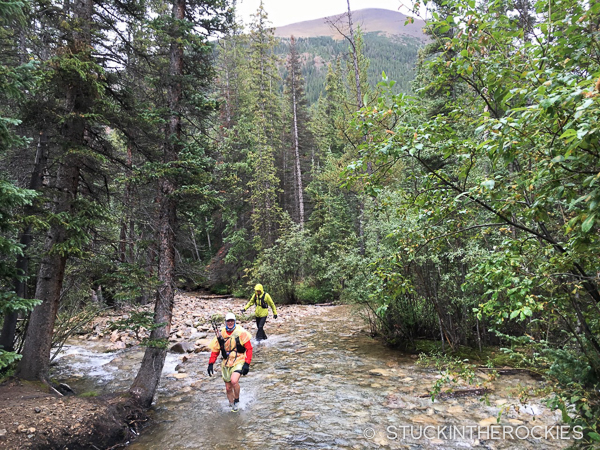 The clouds thickened and it began to rain on us as we pushed through wet willows and forded Pine Creek. 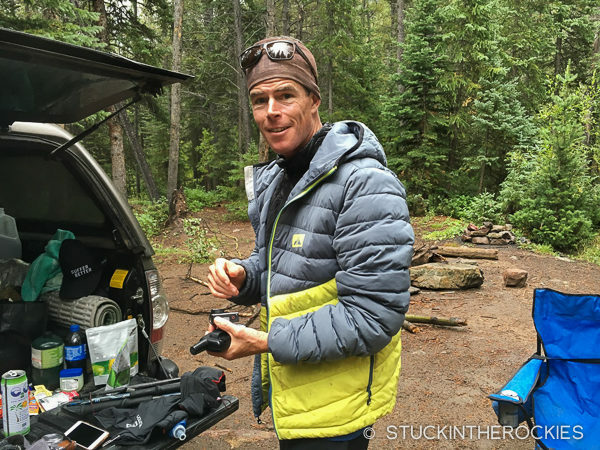 Our good friend Allen Hadley had offered to make the trip into Pine Creek via Elkhead Pass, and we found him where he had set up shop and brewed some coffee for us. It was awesome to see him there but the rain literally dampened the excitement. We took a short break and just sat in the drizzle and drank our coffee, pretending it wasn’t that bad. This was a low point for me, in terms of both energy and enthusiasm. We were right in the middle of this whole thing, between summits #7 and #8 and it was hard to shake that feeling that we had gone so far but still had so far to go. And it was raining. I was impressed that Sully was still fired up, I was feeling the exact opposite. The three of us began up towards Oxford and small cells of weather passed through again and again. As I neared Oxford’s summit it was lightly snowing, and when I reached the top at 12:46 pm, Hadley asked if I had seen Sully. I hadn’t. He was climbing so much faster than I that he had been out of sight for while. A hiker who was on Oxford with us said he had run off towards Belford a bit earlier. And that was the last I saw of Sully. Things started to feel better as I descended off the top of Oxford, which wasn’t a surprise. No longer was I trying to do this at someone else’s pace, no longer was I being worn down mentally by the notion that I might be holding Sully back. I could now just go at a pace that was comfortable to me and maybe even enjoy it a little more. I actually don’t think my pace changed at all, it had just become “my pace” now. It made a difference. And being out of Pine Creek I began to look on the brighter side of things, I had made it pretty far and in only 28 hours. 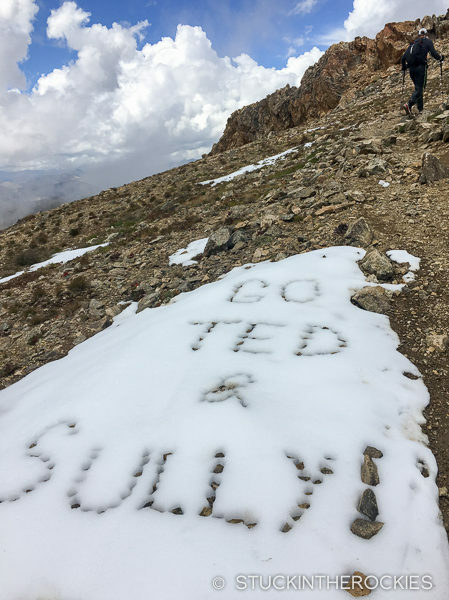 Friends from Aspen, Luka and Anda Smalls, left a message in the snow near the top of Belford. I got to Belford in a rather unimpressive 48 minutes, and then along with Hadley we climbed up the East Ridge of Missouri to summit #10, by 2:58 pm. Thunder and lightning was all around us but we somehow managed to stay out of its direct path. 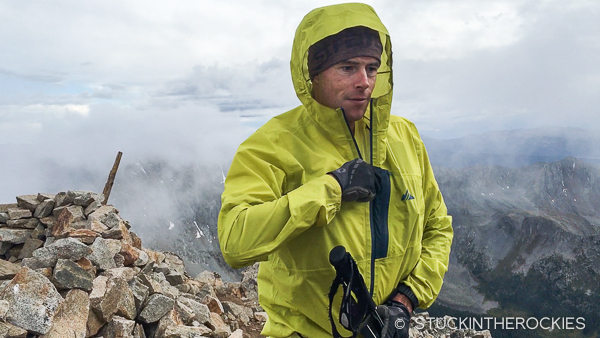 We rushed down the exposed West Ridge to treeline, only catching a slight drizzle. We pulled into Clohesy Lake at 4:15 pm (31:15 elapsed). Allen on one of the exposed parts of the East Ridge of Missouri. Christy, Tim Mutrie, and Luke Stephenson were there and offered me a quick change and some food as we huddled in the trees above the lake and out of the drizzle. None of them had seen Sully blast through there earlier, he was that far ahead, and with us on different schedules now he effectively had no crew. Allen Hadley tagged out at the lake and I began up Huron with Christy just as the rain stopped falling. Huron was actually really nice, even the loose talus field near the top seemed to pass without too much of a fight. The afternoon weather was dissipating a bit and there was a calmness to things. Christy and I made the summit at 6:28 pm and we began the descent to Winfield. Ascending Huron, summit #11. Missouri is in the clouds behind. Off the loose talus and onto the summer trail to the summit. It was still storming out in the distance. A panorama near Huron’s summit that Christy took with all the weather still lingering around. Click to enlarge. This was good, Winfield was a big milestone. I had told myself I would rest there before taking on the last three peaks, and it was looking like I would arrive in around 35 hours. As Christy and I made our way down all alone on the trail, I was really psyched (though very tired). I had about a full day to complete the next three peaks, and I was going to start them off with an hour’s rest. Heading down things felt good, plus I knew I was going to get a short break soon. I arrived at Winfield a little after dark. I downed some food and did a full change of clothes before hopping in the sleeping bag. I was really restless, I didn’t sleep at all, my legs were achy. One hour passed way too quickly. When it was time to get moving I found myself shivering and really cold, I put on all sorts of extra clothes but it didn’t make a difference. 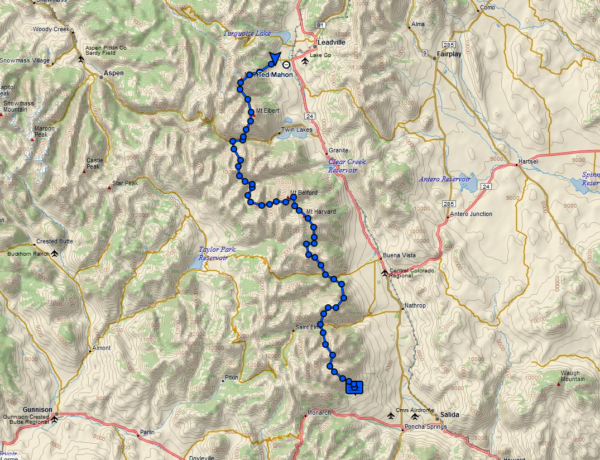 The best remedy for that was to simply get moving, so I got started up towards La Plata with Tim. I quickly warmed up. This being the second night without much sleep I was surprised how I was holding up mentally. 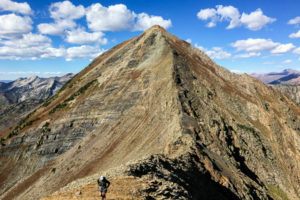 Apart from when we were ascending the steeper uphills which required focus on my breathing and effort, I was able to talk and still recall much of the conversations and details. 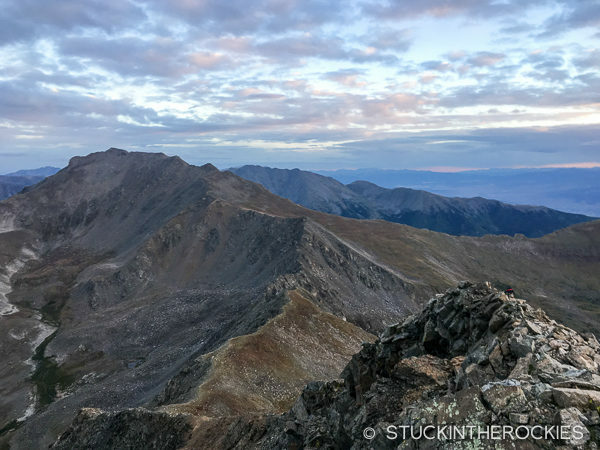 I wasn’t too familiar with the route up the south side of La Plata though, and it felt like it was dragging, a sensation that was only made worse by the winds that started up as we got higher. The headlamp-lit, summit moonscape was disorienting in the wind, and we kept getting sidetracked on all of the little false summits and bumps near the top. We tagged the top at 1:18 am and began our descent which was a bit disorienting as well, despite having been on the trail countless times through the years. It felt like an eternity before we reached treeline. We pulled into the trailhead on Highway 82 at 3:35 am. One additional reason we chose the northbound route was that there was crew access before and after each of the final peaks. I found it helpful not only to see friends and get much needed encouragement, but also to know that I could get some real food after each summit. 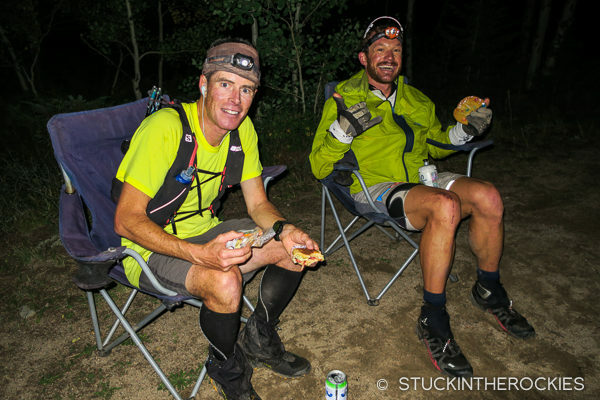 Gels and trail food had long worn out their welcome, and it was more important than ever to keep the calories coming in. Easier said then done though because the last three summits are some of the tallest in the state. One of those was Elbert, which was a beast. 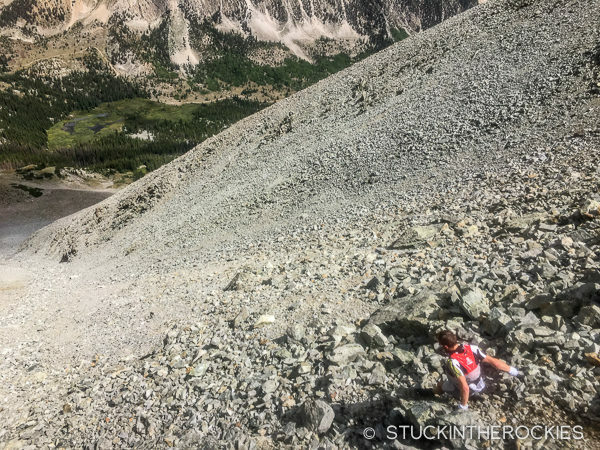 I was familiar with the route but despite my best efforts to eat and drink and stay focused, I had become really sleepy and felt like my pace was that of a snail. Hadley had joined me for this one and he talked things up as though they weren’t bad, but I could just tell this split was doing some real damage to the overall pace. It was a struggle to keep the enthusiasm up, I repeatedly took note about the continued absence of stars as we headed into the late morning. It was dark and windy and it just felt like weather was all around us. 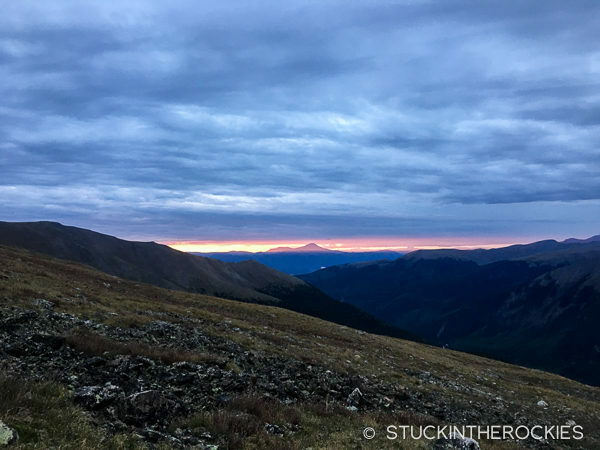 As the skies lit up at sunrise we were still slowly making our way to the summit and I received a message that Sully had gotten off course up here. Afterwards we determined that with a dead GPS he accidentally headed to South Elbert and descended from there as if he was on the main summit. He found himself in fields of wet willows and then forest, and he ultimately emerged near Twin Lakes. The sunrise on the second day. Cloudy and stormy again. Rats. Allen and I on Elbert’s summit before rushing off the ridge. We reached the top at 8:39 am. There were two other guys up there and wind and clouds all around. There was a storm to our east which normally wouldn’t concern me since the weather almost always moves in from the west, yet it seemed to be getting closer. 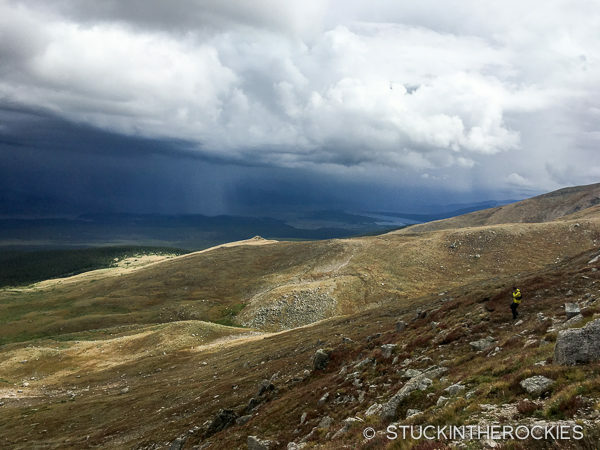 We hustled down the ridge to the northwest and lost some altitude quickly, but once the storm arrived in force, we just bee-lined it down on whatever looked good. By the time we made it to the jeep road below we were soaked, and we followed the road, jogging as best I could to the creek crossing. Tim and Christy were there waiting, at the parking on Halfmoon Creek. Dryfoot Ted not feeling so dry. 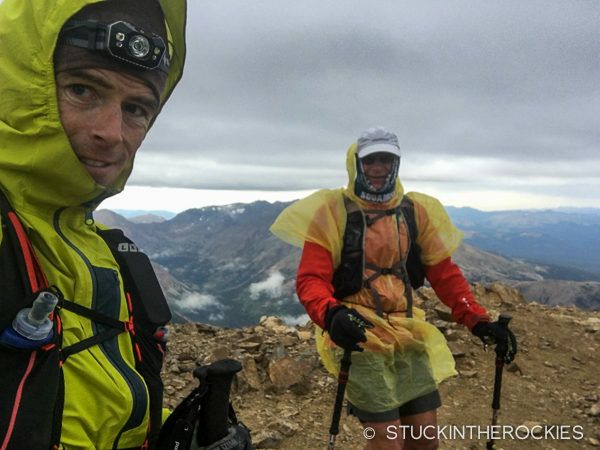 The rain abated as we reached the crew and I did a full change out of all my wet stuff before getting started up the final 14er, Mount Massive. With only one peak left I wasn’t feeling as tired anymore. It was about 10:20 (49:20 elapsed) so I had plenty of time to get up and over before the clock ran out, and that was definitely encouraging. I knew I could do it. At this point it didn’t even matter what the weather was doing, I was so used to being in it, it had just become part of the effort. Christy and I started up Massive and things began to dry out. The sun even popped out at one point. 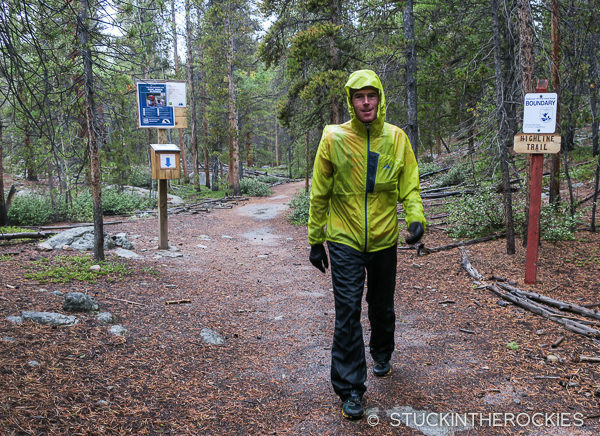 Everything got really wet on the descent from Elbert, including myself. Devices had to be dried out and made sure they were still working. Eventually, after a full change of clothes and shoes I was ready for the final peak. First we had to get up the road. And then to the trail. Hikers descending Massive repeatedly told us the weather didn’t look good, blah, blah, blah, there was snow on the ground up high, and that we should be careful and even consider turning around. Christy offered polite “thanks” and I just silently walked by. Clearly they didn’t know how much weather had already been encountered. It was a bit drier, but there was still weather all around. Finally we reached the summit ridge. It always goes a little longer than you remember. 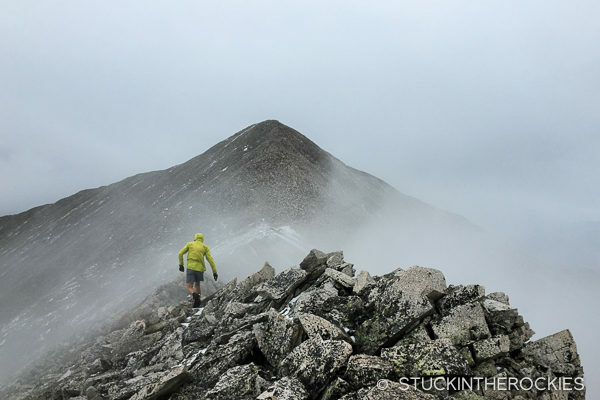 In the clouds and on top of Mount Massive in 52:52, the fourteenth summit of Nolan’s 14. 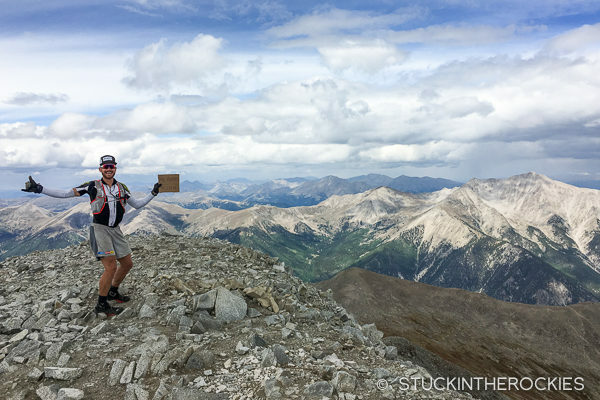 I moved up Massive faster than Elbert, mostly due to the excitement to potentially be wrapping this up, and Christy and I reached the summit in the clouds at 1:52 pm, 52:52 elapsed. We took about 10 minutes up there to sit to take it all in though I have to admit I was so exhausted mentally it was tough to glean any meaningful closure on anything. The sky was cloudy but things were breaking up, and as we began down to the Fish Hatchery it actually cleared for a bit. Of course it seemed totally appropriate to observe another big storm cell with a visible wall of precipitation approaching from the east. We hustled as fast as we could towards treeline hoping that we’d get out of its path, but it only moved closer while growing in size. Heading down into the whiteout and towards the Fish Hatchery. And after descending a bit the clouds broke and the next wave of weather, visible behind, moved in. We were almost to treeline when the hail began, and with it came thunder and lightning. 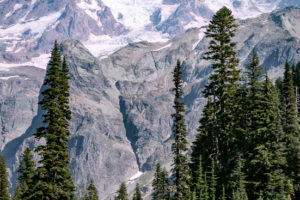 Rather than stick to the route that trended north towards the finish, we just headed straight down the fall line to get to the cover of trees. 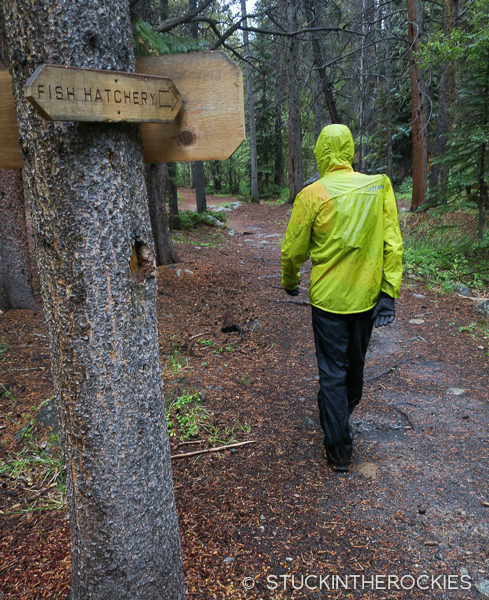 We knew the Colorado Trail was below us and even though it was slightly out of the way it would eventually lead back to the Fish Hatchery. I was drenched and as I tried to run my legs just wouldn’t go. Christy motivated me as best she could but I couldn’t seem to move any faster than a hike. But a hike was fine. I didn’t really expect to have much left in the tank at this point. So we just made our way down as quickly as we could and we emerged from the trail to a small cheering crew in the pouring rain at 4:37 pm. I tried. But all I could muster was a hike. Normally I always find I have a finish push in me. Not today, and that was despite Christy’s best efforts. Need I say it? That was hard. And Nolan’s was done. We all huddled out of the rain under the small roof by the information kiosk. It was a bit anti-climatic I suppose, it wasn’t the dry and sunny hangout I had envisioned, but it was fine. All the important people who helped were there and that was what mattered. We got out of our wet clothes and ate some leftover crew food and debriefed a bit, and then just decided we should probably hit the road and head home. An effort of this scale takes time to process and it wasn’t going to happen there that afternoon, regardless of the weather. Cold and wet, it was time to change and head home. No post event celebration today. if anything we all just needed to sleep. I have to say thanks to those that supported me, in particular Christy, Tim Mutrie, and Allen Hadley. I couldn’t have gotten this done without their help. Like the often unsung sherpa heroes who allow for success in the mountains but take no credit, these guys deserve some for keeping me moving forward, and they definitely helped keep things as fun as possible through it all. Thank you. Luke Stephenson was a great help as well, particularly getting everyone up or down from Clohesy Lake, Sean Shean’s unscripted arrival to join us for Columbia and Harvard was exactly the type of surprise that helps in the middle of an endeavor such as this. And Sully’s first-shift crew of Cher and Derek helped round out the team through the beginning. Thank you everyone. Of course I have to say thanks to Sully for being the wingman through the recon and a positive inspiration since we started talking about this way back when. I was sorry it didn’t go according to plan but I’m certain he’ll be back out there soon to get it done right. Nolan’s was harder than I expected. I first learned of this challenge in the early 2000’s and back then I told myself I hoped to make an attempt someday, but I always felt I needed to get more experience first. And so that’s what I did. The fact that I found it to be as challenging as it was– after years of long days, ultras, peaks, expeditions, and assorted mountain challenges– speaks to its difficulty. And as if the course isn’t tough enough, the 60 hour cutoff is unbelievably tight. For anyone who reads a post such as this in hopes of learning some pointers about how to succeed, my answer is there aren’t many to offer. It’s not possible to distill this massive effort into a bullet list of insider tips. 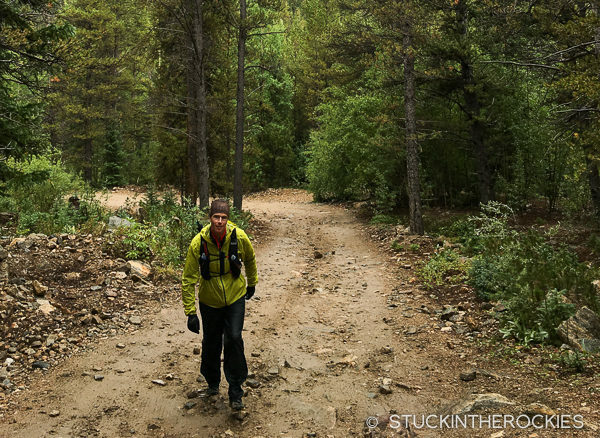 Written words, GPX files, or route photos might help in some planning but they won’t get you to the finish. 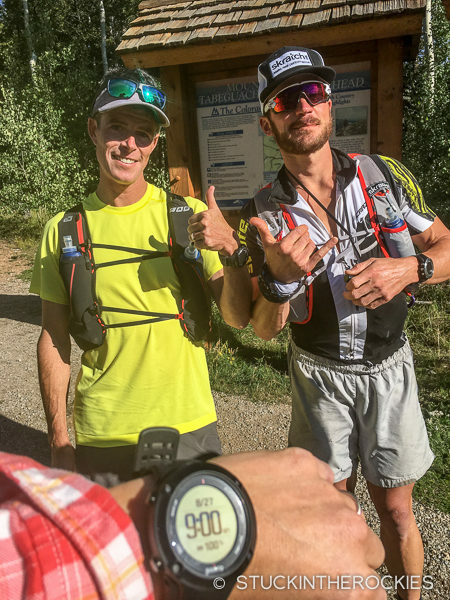 Nolan’s encompasses so much, success at it isn’t just about being a talented trail runner, peakbagger, or endurance athlete, though that might help a little. It’s way more than that. I’d encourage anyone truly interested in Nolan’s 14 to make it happen. It’s out there for anyone and everyone to attempt and it’s an incredible experience— humbling and unforgiving and yet inspiring and rewarding at the same time. I’ll post a GPX file soon. The Nolans map. Click to enlarge. The clock, elapsed time, and individual splits. looking at the gps plot, it is surprising what a tight straight shot it is south to north. i never thought of all these peaks that way.. having only done them one at a time, many with you! an amazing achievement.. proud of you , bro! Bravo, Ted. I was out there N-S last weekend and got 7, so have a whole new perspective on how truly difficult this is and the mixed bag of skills and experiences it takes, both physically and mentally, to take it on and complete it. Thx Dennis. I can be pretty direct of you choose to just go that way. The summer trails most people are familiar with aren’t the fastest way to go since they’re often too out of the way. Congratulations, that’s amazing. The tracking link was fun, your progress was so steady. I know a couple of others that have tried this, and had the running chops, but bailed a few peaks into it. 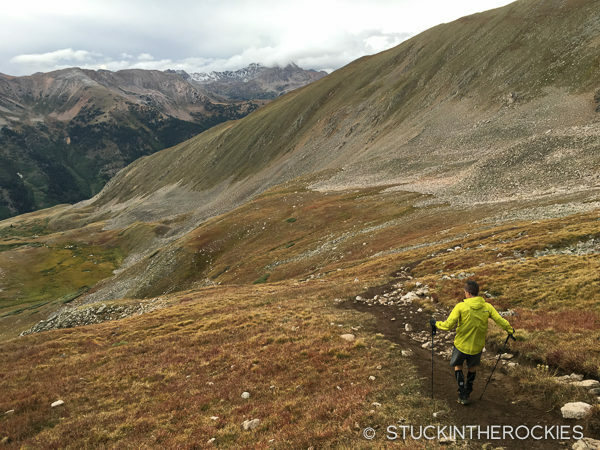 I’ve got to believe backcountry experience is pretty important as well as endurance. I don’t want to call it familiarity with pain, but let’s say adversity and variety of conditions. Nice work! I’m not sure if people realize how much more it is than a trailrunning outing. 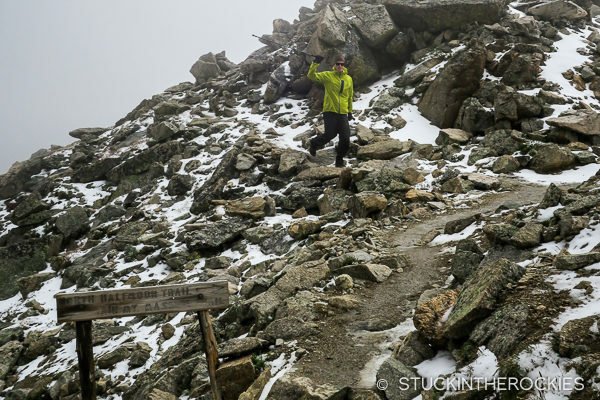 It’s an off-trail, navigation, sufferfest. I think I ran less than 20 miles total when it was all said and done. Probably less. Great post, Ted, and thanks for sharing. Really well written. Thx Scott. Especially considering I feel like my mind is still a bit frayed from the effort. You are amazing Ted! I can’t imagine how hard even as your support crew it would be. Ha! Congrats!! The crew was fine. There was a box of gels for them to eat as they waited for me through the weekend. Seriously though, they are so important and it helps that they had so much experience that they always knew what was needed and were never caught off guard. Definitely pro level. I can’t imagine having to deal with the weather, wet rocks, etc. after being out for 40+ hours. Really impressive that you finished under those conditions! Ted, as I said before, a huge congratulations to you & your crew! This is really impressive stuff! Nick? Are you kidding me? How are you even awake right now? Close the laptop and go back to bed. But first, congrats. Nice job. If you stayed on course over La Plata you probably would have been faster than me, like you usually are. Hi Ted – What watch did you use for this and were you able to get the whole track on a single charge? John, I had a Suunto Ambit 3 (Peak) and set it to the longest interval for tracking, I think 60 seconds. I plugged it to charge a bit at each of my two breaks, and when it was all over it was still more than 50% charged. I love the watch and recommend it. I had a first generation Ambit before this one.